Our customer Karen made this dress for herself out of a lovely wool crepe. The pattern is Vogue V1136. I love the great details on the jacket. Please join our flickr group and share your latest creations! Lots of new fabrics in the store this week! We have the new line by Ty Pennington from Free Spirit, as well as these cotton/linen blends designed by Valori Wells. In addition to these wonderful prints, we have a new series of prints inspired by the work of 1940s and 1950s textile artist Tammis Keefe. These whimsical prints feature dogs, cats, even crocodiles in an array of charming mid-century colorways. Please remember to share photos of your sewing and crafting projects on our flickr page. It's always so fun to see what everyone is making! McCalls 5094 a photo by Patty the Snug Bug on Flickr. 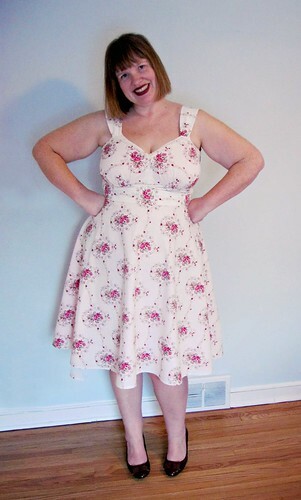 Patty made this wonderful dress using McCalls #5094. It looks like she's ready for the Spring! Check out Patty's fun blog, it's chock full of great sewing and lots and lots of inspiration. Keep posting those photos in our flickr pool! We love to see what's on your sewing tables. It's time again for Book Review Corner. Our topic this week is Sewn Spaces by Joel Dewberry. This book is full of imaginative and beautiful projects for you and your home. Beyond the usual projects like pillows or pajama pants, as great as these are in this book, there are also some unexpected gems in here. These journal covers are a quick and easy way to give an ordinary notebook a little zing. This project to etch the glass of a frame is truly inspired. I may have to do this one in my own home. Along with these wonderful projects, the photo styling is clean and very inspirational. The color palate is calm and soothing, while remaining fresh and clean. If you have any sewing or crafty books that you loved (or hated) please share them with us! We'd love to review one of your favorites.